Starting in the 16th century, the game of tennis had gained popularity and play, which tended to revolve around the elite classes. The origins of the game are still disputed, but one thing we know for certain is that royalty in the countries of France and England controlled the game in earlier centuries. In its development, tennis gradually took its turn from using hands to return the ball to using the racquets we see today, hence the French name for the game “jeu de paume” (“game of the palm”). By the year 1850, the Industrial Revolution introduced a new type of rubber ball that would emerge into the yellow felt balls that are now played with. A few decades later, real tennis, often called “the sport of kings,” that was played indoors developed into lawn tennis in Great Britain and spread to the United States and throughout Europe. The first lawn tennis club in Great Britain was the private All England Lawn Tennis and Croquet Club, and the game is still dominated by those wealthy enough to be a part of this club. As the sport grew in popularity, the best athletes worldwide began to compete in single-elimination tournaments, leading to the “open era” of tennis. Naturally, those who showed promise and hunger for competition in the game dedicated years of training to play at an elite level. With years of training came an investment of hundreds of thousands of dollars, and for those playing professionally, it could be several million dollars. Without this investment, the probability of turning professional is often unlikely. Therefore, this opportunity is much more readily available to those wealthy enough to make the investment. The question following is: are the best athletes really playing the sport? Last May, in an interview with Jason Gay from the Wall Street Journal, Roger Federer acknowledged Serena Williams as the “greatest player of all time” in both men’s and women’s tennis. In her achievements, Williams has the most major titles of any player ever to play the game, and furthermore, she has not been given the opportunities nor the support that most professional tennis player have received by their sponsors. Coming from the country of Ghana, one particular tennis player by the name of Emmanuel Mensah was faced with a similar challenge. Mensah was born in the small village of Korle-Gonno right on the coast of Accra, Ghana, where he picked up a racquet at the age of seven. Mensah found a rare passion for tennis that allowed him to enjoy every moment he was able to spend on the court. Since public courts were not readily available in Accra, the only way that Mensah was able to play was to work his way into one of the clubs. Buying a membership was never an option, so Mensah did the one thing he could think of: working in the club in order to get court time after the members left. Not having the opportunity for tennis lessons or a membership, Mensah was working from a disadvantage. The chances of ever playing at a competitive level were less than slim, but this was no factor of discouragement. Relying purely on his talent, work ethic, and spirit for the game, Mensah compensated for the lack of funds and support that his competition had. At the age of 18, Mensah immigrated to the United States, discovering that opportunities are not as scarce as he had known them to be. “Here, the availability of tennis courts is often taken for granted,” he comments. Racquets, clothes, and the proper shoes are not difficult to find either. San Diego has some of the finest coaches that know how to teach the game at an elite level. Chances upon chances are given to those athletes who can afford these essentials, and anyone both wealthy enough and willing to make this investment can learn to play. After Mensah graduated from college, he knew that playing professionally was not in the cards. 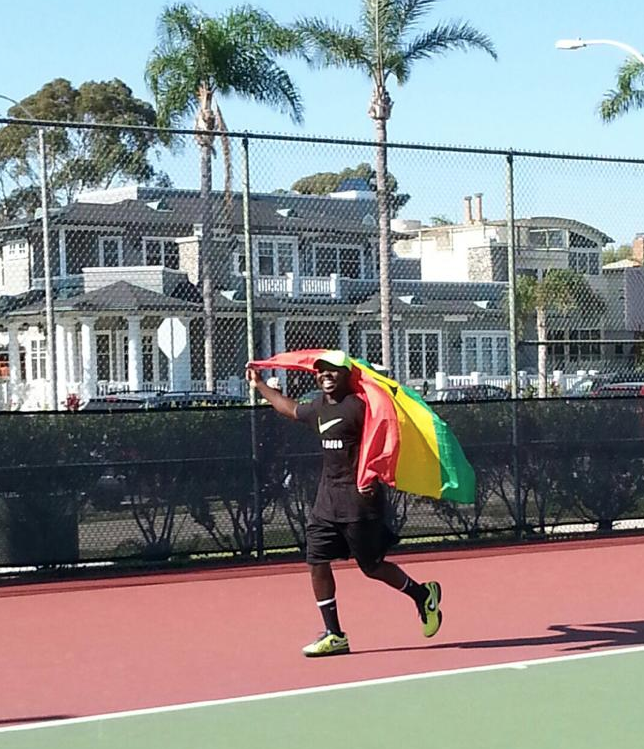 With family he needed to support in Ghana, his life brought him to San Diego where he would work as a tennis pro in Coronado. Mensah then saw the drastic difference between tennis programs here in the US compared to those in Ghana. Here in Coronado, there are nearly ten pros on staff, countless others in all of San Diego, and sanctioned tournaments every weekend. “Everything in Ghana is competitive,” Mensah acknowledges. “If you don’t train hard everyday, there’s no guarantee you’re going to do well in the next tournament.” Because this is never a guarantee, players in Ghana are continuously seen working to improve their performance in competition. Mensah understood that nothing would be given to him and that he would be up against players with the strongest work ethic. What many of his opponents are not aware of is that he is a teaching pro who does not train, has two kids, and still supports his family back in Ghana. Yet, his raw talent and ability have bested the investment that many of these prospective players made. Mario DiLonardo, a teaching pro at Coronado who played competitively in college himself, immediately recognized Emmanuel’s ability to play at an elite level. 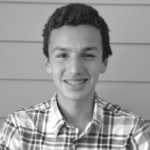 “Emmanuel has incredible layering of strategy and adjustments, so he can beat bigger people who have spent more money in a very efficient way,” comments DiLonardo. “He has super explosive movement due to his work ethic (not just naturally gifted), never gives up on the ball, has exceptional rhythm and feel, and a sense of the game that cannot just be taught or bought in a lesson.” If one were to see Mensah on the court, it is clear that he does not blow people off the court with his height. Being five-foot-eight, he had to learn to shrink the court with his speed. Back in 2012, Mensah had the chance to play Taylor Fritz in an exhibition match at the San Diego Tennis and Racquet Club. Fritz is currently ranked #42 in the world on the ATP World Tour. At the time, Fritz was 15 years old and playing for Torrey Pines High School, while Mensah was making a living by teaching in Coronado. In a close three-set match, Mensah was able to pull through with a big win after being down a set. Similarly, in a recent tournament, Mensah took another win against CIF San Diego Section Champion Ryan Seggerman—San Diego Section CIF Champion who’s currently playing at Princeton University. Both of these players exemplify the epitome of the way tennis is taught in the United States. Tall players, flat and hard hitting, and attacking the net on most points, as opposed to a fast, layered, and efficient game. Mensah, being only five feet-eight inches in height, would not likely be recognized by a sponsor because he lacks the stereotypical qualities of a “good player” in the US. Rather, there is a reason why the US is no longer dominating the tour, especially among male players. In the era of John McEnroe, Pete Sampras, and Jimmy Connors, American champions were not scarce, yet they have decreased in number compared to European countries. Tennis has shifted focus from hitting to overpower to movement, touch, and spin. Rafael Nadal, for example, developed a style of play that keeps his opponents from overpowering him by hitting a ball with immense spin. This, of course, led him to a No. 1 world ranking, and he is often argued to be the best competitor in tennis history. Similarly, Mensah followed the trend of this shift in tennis in a unique way. He has overcome the challenges of having a humble background, and since his style of tennis is not congruent with what predominates in the US, he has not received the support that others have had—even if he is the better athlete and the better player. 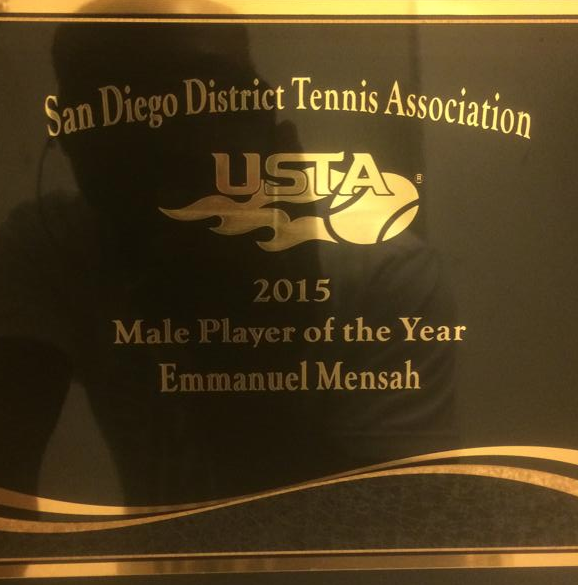 There is no doubt that Mensah has more than proven his potential and his skill as an elite tennis player. However, sometimes this is not enough. “The champion of tennis is not decided on who’s the better athlete or the better person; it’s decided on who has better and more support,” says DiLonardo. Unfortunately, inequity is a reality that many players have faced, and it undoubtedly prevents them from reaching a level that they would have never imagined. Mensah is certainly in this category of people who never truly had the opportunity to play among the wealthier players who received the proper support. And now, at age thirty, he might never find out how good he could have been. Yet, out of the bitterness of inequity, there is a beautiful story about someone rising above it. 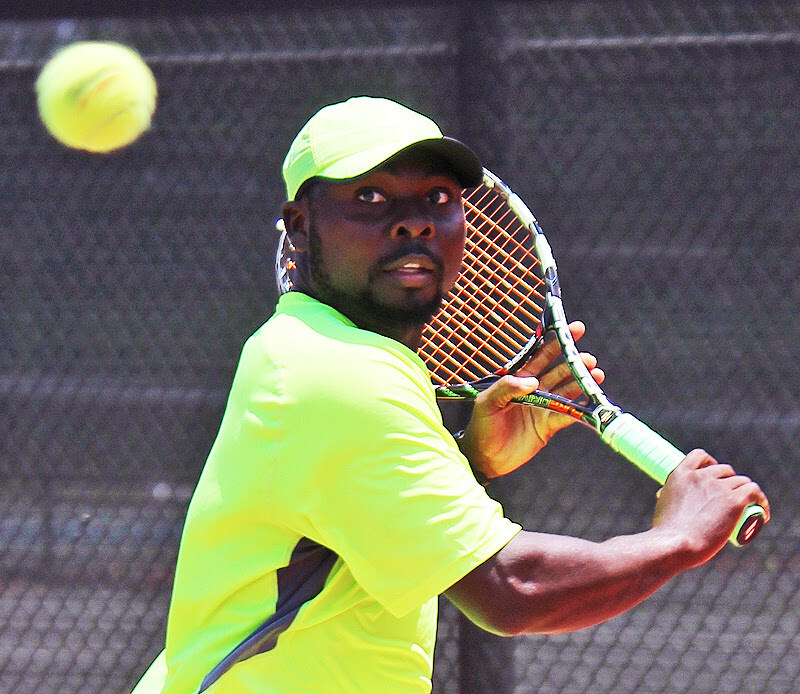 Mensah, while not being able to play on the tour, has had the opportunity to preserve and augment his love for tennis by playing the game for himself. And for this reason, he is able to beat people who have had more than he ever dreamed of having. He has been able to evade the feelings of entitlement that often keep players from improving. He can enjoy the game that has broken people down mentally because they felt entitled to winning, rather than learning a style of the game that entails an unparalleled work ethic that Mensah developed as a junior player. Now coaching tennis in Coronado, Mensah has been able to transmit his love for tennis to his students and his community.